The past couple of weeks have been hectic at our house. Jon’s classes have kicked it up a notch and he spends much of his time studying. I have been putting in long hours at work planning for one of our biggest fundraisers of the year, which is coming up on the 26th. Needless to say, there hasn’t been much time for planning and cooking meals. Last night, we needed something quick and easy… and we needed to use all of the vegetables in the fridge that were hovering dangerously close to going bad. 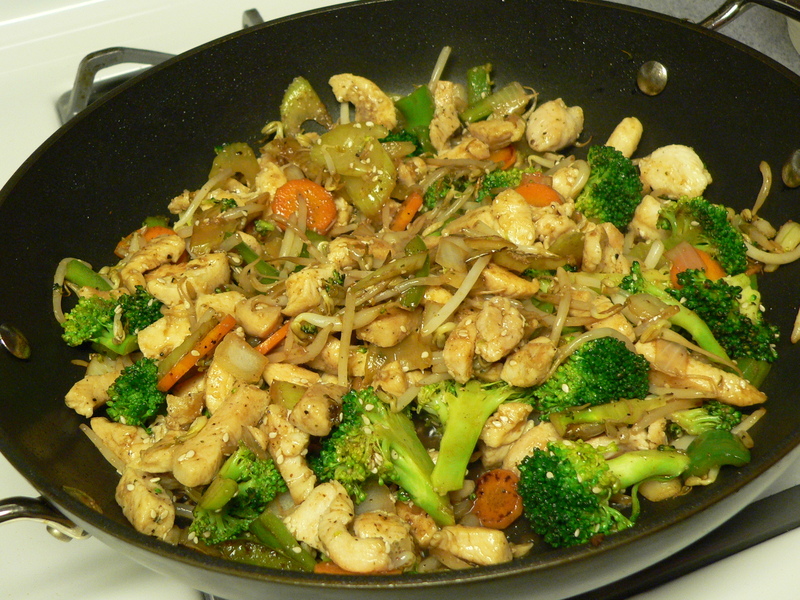 Leave it to Jon to improvise and create a beautiful stir fry in less than 30 minutes. Toss chicken with 1/2 teaspoon soy sauce, 1/4 teaspoon cornstarch, and a pinch of salt. Stir together rice wine, remaining 2 teaspoon soy sauce, and remaining 1/4 teaspoon cornstarch. Heat wok over high heat until smoking, then pour 1 teaspoon oil down side and swirl to coat. Add chicken in 1 layer and cook, turning occasionally, until browned, less than 1 minute. Transfer to a bowl. Add remaining teaspoon oil to wok, then add ginger, garlic, cumin, red-pepper flakes, and Chinese 5 spice and stir-fry 15 seconds. Add celery, carrots, broccoli, bean sprouts, and water chestnuts and stir-fry 1 minute. Stir rice-wine mixture, then pour into wok and stir-fry until sauce is bubbling, about 30 seconds. This has officially convinced me that I need to purchase a full-size wok pan for my kitchen at home. My family loves Chinese food, even my kids (5 and 7). I love to cook. This would be so easy with a wok. It’s official. I am buying a wok. Everyone needs a good wok. It makes things so much easier. If you get one, please let me know how you like it. We were in Chinatown for Christmas and found a couple of others we wanted to invest in.